As the person responsible for leading the Fall TIPS implementation at your site, your first step is to gain the commitment of hospital leadership. 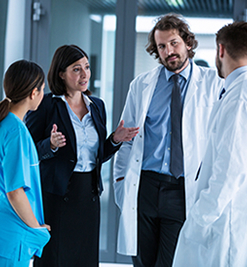 Now that you understand your hospital’s governance structure, begin reaching out to leadership committees relevant to fall prevention and securing buy-in. Our research has shown the important of leadership support for robust and sustainable implementation, therefore this step is key in your Fall TIPS implementation success. Use the Fall TIPS Leadership Talking Points document to guide your conversation. You can also refer to the “About Fall TIPS” page on our website. Now that you have secured leadership buy-in, it is important to create a plan for implementation. This chart will help you evaluate your current fall prevention protocol’s components and how they compare to the components necessary for Fall TIPS implementation. Upon completion, you will be able to identify which areas of implementation may require the most work. SWOT stands for “Strengths, Weaknesses, Opportunities, and Threats.” This form is meant to help you identify strengths/weaknesses and how to leverage/address them respectively. Upon completion, you will understand your team’s strengths and weaknesses as you plan implementation. This checklist lists the key preparatory activities required for Fall TIPS Implementation. It addresses steps that will be elaborated later on this page, but is helpful for planning purposes and provides foresight. It can be used as a guide throughout the implementation process. Create a plan to reach out to the relevant committees. The Implementation Guide that follows is based on hospital governance structure where Nursing Practice Committees will be your main point of contact for implementation. In this case, the Nursing Practice Committee is a unit-specific group led by the unit Nurse Director and includes unit-specific clinical nursing staff.